Broadcast on Channel 5 (UK) 01 May 1997 Thurs 4:40 a.m. Product placement corner: presumably this was a real restaurant? (though the red brick walls do give rise to doubt...). Steve mispronounces the name "Sergei's" as if it were Russian, but Jean (who affects to find the place overpriced and extravagant) is neverthless able to correct him. Anne is thought to be missing, but Erica cannot accept she has just disappeared into thin air. Meg suspects she may have got hold of uniform and points out she could have had help from a friend on the staff. Vera swallows hard and says absolutely nothing. Erica decides to call the police. 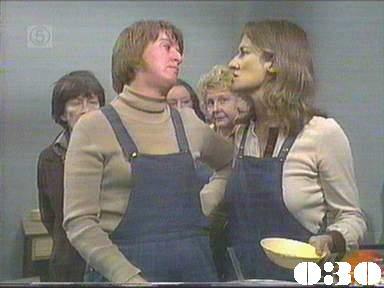 At home, Meg has to calm Jean down from informing Erica straight away about Vera's association with Anne. Jean is invited by Steve for dinner: she agrees but only so she can tell him what she thinks of him over his behaviour in the Susan Rice case. Vera tells George that Anne is missing: he reminds her of the letter Anne's solicitor has, which could possibly incriminate them both. Monica is planning to take over as top dog, assuming that's what Bea would have wanted. At dinner, Steve tells Jean that he has only invited her to introduce her to Clara Goddard who is a potential charitable benefactor for a halfway house. Clara rejects Jean's suggestion that she gives her money to the Salvation Army and says she wants the house to be run by the women themselves. Jean becomes suspicious when Karen is mentioned as a possibility to run it. Monica has to take on Noeline in a fight for caretaker top dog position, but Noeline is blamed for the fight and put in solitary. Meg visits Mum and Judith Ann, and tells Mum that Bea is in hospital. Mum mentions she might visit, so Meg reminds her of the conditions of her parole. Monica takes over the press: Lizzie opens the door of one of the dryers and finds Anne suffocated . Det. Sgt. Grace investigates: he is scornful about the idea that it was an accident and wonders how the door was closed from the inside. A flashback shows that Vera has suddenly remembered closing the dryer door, but she keeps quiet. Monica taunts Noeline in solitary and hints that she might be held responsible for Anne's death, as they were last seen together heading for the laundry. Judith-Anne encourages Mum to visit Bea suggesting she just turns up with a plant or a bunch of flowers. Steve's senior partner Charles Baldwin tells him they have to do less "charity" Legal Aid work. In retaliation for Monnie's attack on her, Noeline lags on Monnie, accusing her of killing Anne Yates. Judith Ann lets slip to Jean that Meg has been visiting her and Mum against regulations. Monica is questioned by Inspector Grace, who says a "witness" has accused Monica of knocking Anne out with an iron before putting her in the drier. Erica relucantly sends Monica to solitary even though she points out to Sgt Grace there is no real evidence. George gets Vera to agree to come away with him and leaves an envelope with her that he wants her to bring with her when he contacts her and tells her he is ready to pick her up. Vera phones the prison to say she's sick and won't be coming to work. Syd is annoyed with Lynn because he suspects Geoff is attracted to her. Vera packs ready to leave and paces up and down waiting for George to call her. The autopsy report shows that Anne died of suffocation, so Erica releases Monica and puts Noeline in instead. Mum visits Bea in hospital, but is not allowed to see her. Det Sgt Grace visits Vera to ask about her friendship with Anne, just as George phones: he tells her the envelope contains money and she should keep it for herself. Joan goes to see Steve to apologise to him, just as Clara arrives to consult Steve, saying that she's worried that she's about to be arrested .